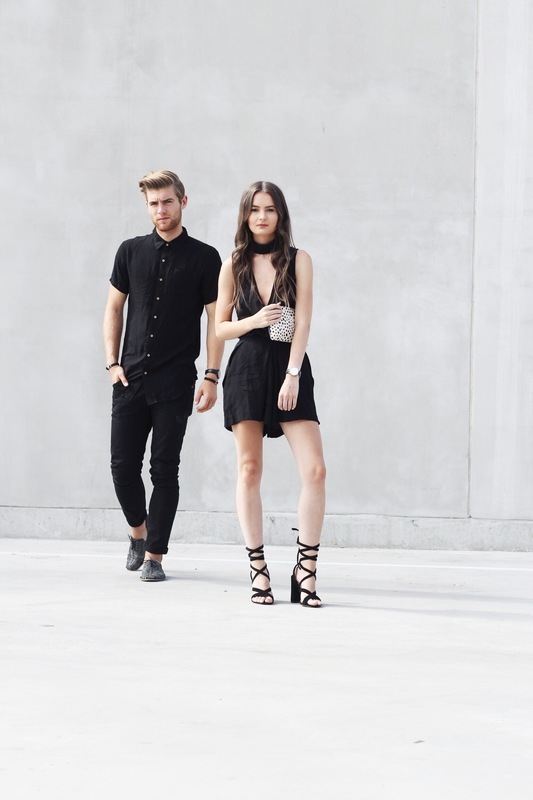 TOP: Shilla The Label // SHORTS: Shilla The Label // SHOES: Tony Bianco – on sale now! We’re like the Men in Black except clearly male and female and totally cooler than Will Smith & Tommy Lee Jones… Haha we wish! But on a serious note, black is “100%” cool, as clearly quoted by Sam. You know that tagline thing that everyone has? Mine is “yeah right” or “yeah really”, which since noticing, makes me seem less interested in conversation than I actually am – I promise to all who notice it out now that I am not shrugging you off! Okay, but seriously, let’s get more onto topic. The way we perceive things every day has a lot to do with our beliefs growing up and the traditionalist views that our parents or education have instilled into us over the years. The colour black is associated with power, elegance, formality, death, evil, and mystery but there was a time, maybe 10 years ago, when we thought that people who wear all black were “emo” or “punk”. We all had our mind shaped to fear being emo or punk as we were brought up with numerous negative connotations surrounding it. 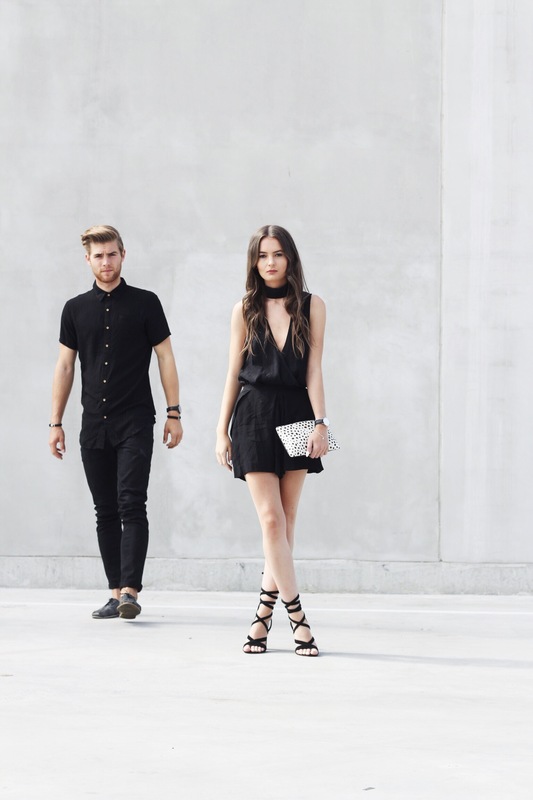 We would go through primary & secondary education with this idea that wearing black was not a normal thing. However, trends come and go and there was a time when we were 14 and thought that people who wore all black were scary and odd, but then we grew up a little and we noticed that black is the colour of Melbourne and it defines us. As I became so immersed in the fashion world, I fell victim to this “all black plague” and fell into the black hole – I was sold. As time goes on, we won’t let this colour define us in a negative way like the world once used to, however we can recognise the power that this colour has in our culture today. Some think of it as dull, some think of it as elegance & some honestly just don’t care whether they are cool or not. 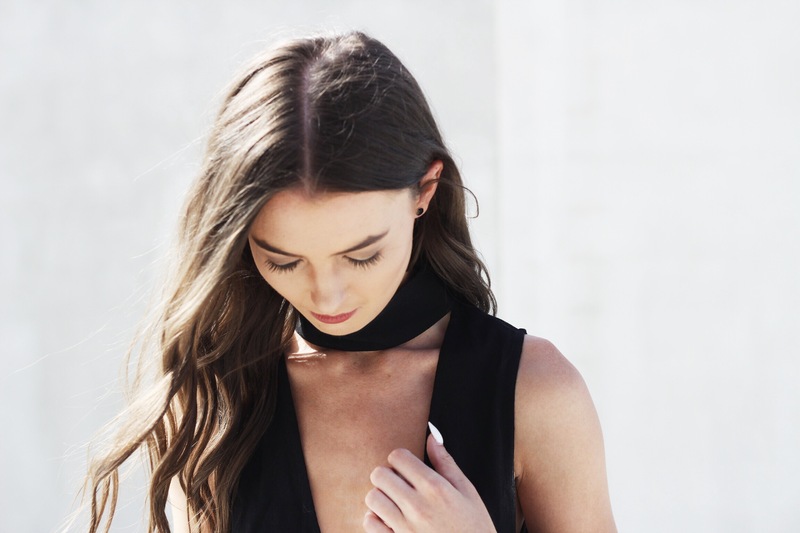 For us, it’s whatever comes naturally, we won’t fall into Melbourne’s scene of ‘all black everyday’ as we like to explore our style both individually and in collaborations together. Just like here, we chose to recognise pieces that we loved so much in a ‘blogger blackout’ kinda way! We absolutely love our outfits here. I live in my little top and short combo all the time and Sam can’t help but wear this ensemble on a night out! All I can say is stay peachy and stay YOU. Do not follow the scene just because it’s the way to fit in. When you are YOU, you shine greater than anyone who’s trying to fit in. Your presence is so strong when you start to focus on your own happiness and everything will just fall into place around you. 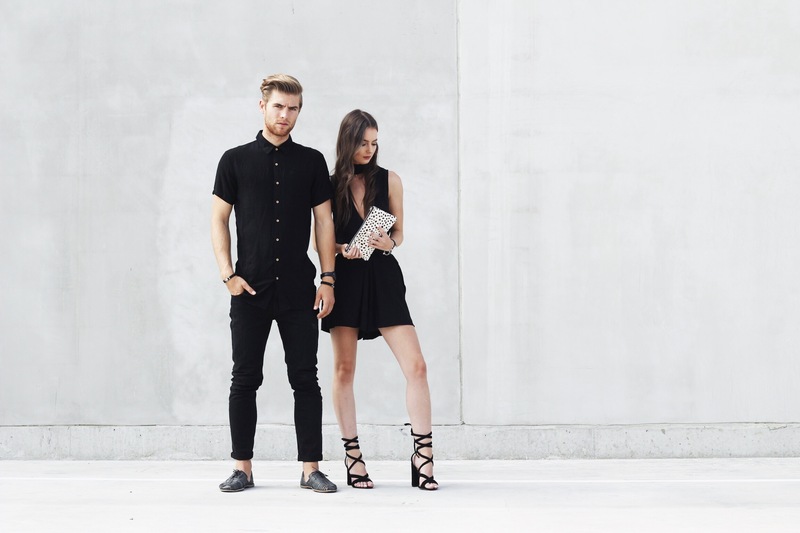 Wear black because it’s you, not just because it’s the cool Melbourne thing to do. Love, love, love!! Fabulous as always~ Keep up the good work!